Spring is finally here! The weather is warming up slightly, the days are getting longer and the flowers are starting to bloom. I love everything about Spring/Summer, including the food of course! As soon as the weather starts to get nicer and the sun is making more of an appearance I start craving more fresh foods, delicious salads, lots of citrus flavours and fresh herbs. 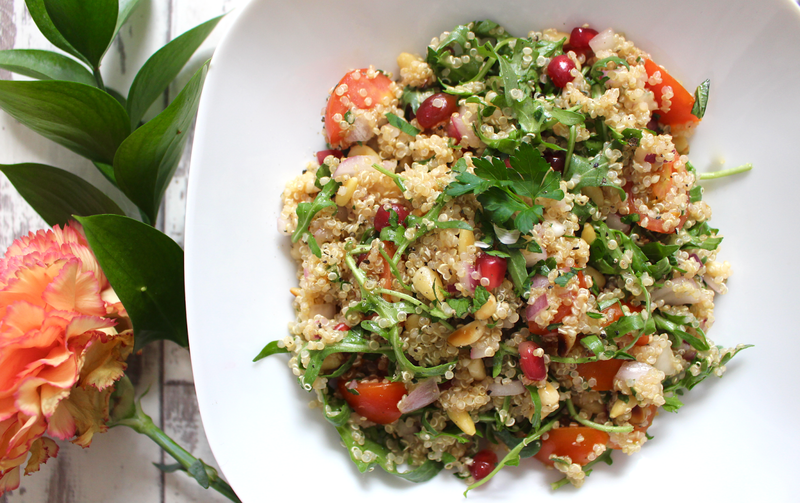 My current favourite salad is this scrumptious quinoa dish with pomegranate, rocket and lemon that's just perfect for Spring and will be divine when the weather gets even nicer to accompany BBQ dinners. 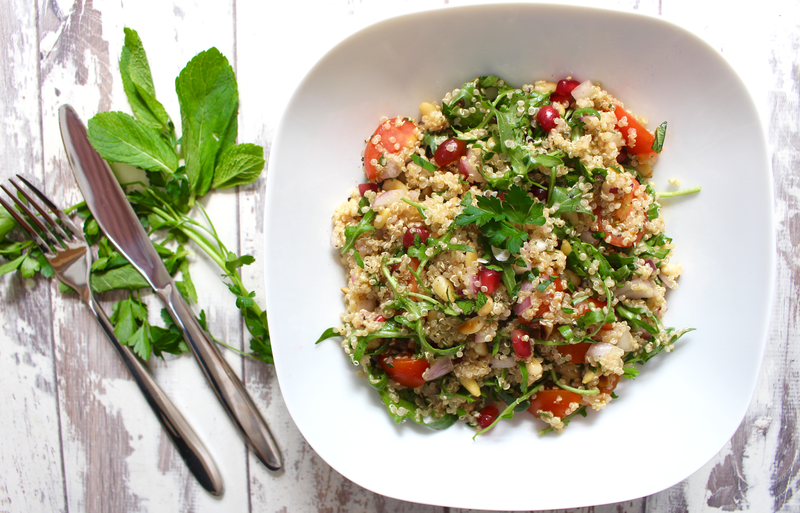 Quinoa makes an amazing base for this salad, the slight nuttiness and delicious texture goes so well with the other flavours in the salad and it's packed full of goodness too. 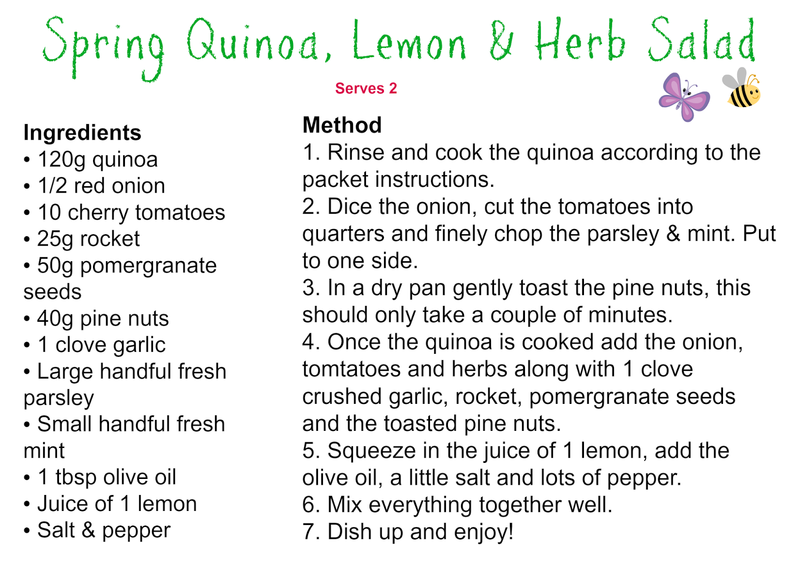 Quinoa is my favourite grain (although technically a seed) and it's one of the only whole vegan sources of all nine amino acids, making it a complete protein! It's also bursting with heart-healthy fibre, lots of iron and it's super easy on digestion too. I've added parsley and mint to this dish which just go together like a dream and help to create those Spring food flavours I love so much - parsley is rich in anti-oxidants and has been shown to prevent cell damage, it's also an excellent source of vitamin C and folic acid and mint is also high in anti-oxidants and aids digestion as well as being a natural breath-freshener. I've also including pine nuts and pomegranate seeds in this salad which are a great pair with the pine nuts adding a crunch and the pomegranate bringing delightful sweetness. Pine nuts have been shown to boost energy levels and contain many vitamins that are especially good for eye health. Pomegranate is super underrated too as this gorgeous fruit has a huge range of beneficial compounds including vitamin K, vitamin C, folate and anti-inflammatory powers. Pomegranate helps fight inflammation, reduces the risk of certain types of cancer (including breast and prostate), helps lower blood pressure, eases joint pain and can even help you stay looking young. As you can tell, this salad is bursting with plant-power as well as tasting absolutely heavenly!